Enjoy this short film about the Algerian contemporary artist Malek Salah as he prepares for the inaugural exhibition titled ‘Majnûn Laylâ’ for the new Modern Art Museum of Algiers, the first of its kind in the Arab world. The film brings deep insight into Salah’s world—his creative process, the information contained within his work, his relationship to his art, and through it, with the Algerian society. This beautiful film of a meditating Algerian artist, Malek Salah, is a fine example of a famous artist profiled by one of our MUM students, who later became a videographer for DLF.TV. The young filmmaker, Amine Koudier, a senior student at the time in MUM’s digital media class, was asked to make this film to accompany an opening exhibit of the new Modern Art Museum of Algiers (MaMa), the first of its kind in the Muslim world. When Amine showed it to me I was really impressed and encouraged him to translate and add English sub-titles and enter it into competitions. I ended up helping him with the French to English translation, and he won first place wherever he entered it. He took the top 2008 Award of Excellence in the student category from the Iowa Motion Picture Association and Winner in the student film category of 2008 Landlocked Film Festival. David Lynch visited the students when he was here last year and commented on this film. He said he loved the artist, his work, and what he had to say about it, and how Amine had portrayed it—high praise for a student. Amine was later hired to work at David Lynch Foundation Television upon graduating. Read an excellent article in the Iowa Source written by Mo Ellis about him and the film. Watch the 13-minute film Malek Salah: ‘Majnun Layla’ on DLF.TV, on Vimeo, or on YouTube Part 1 and Part 2. 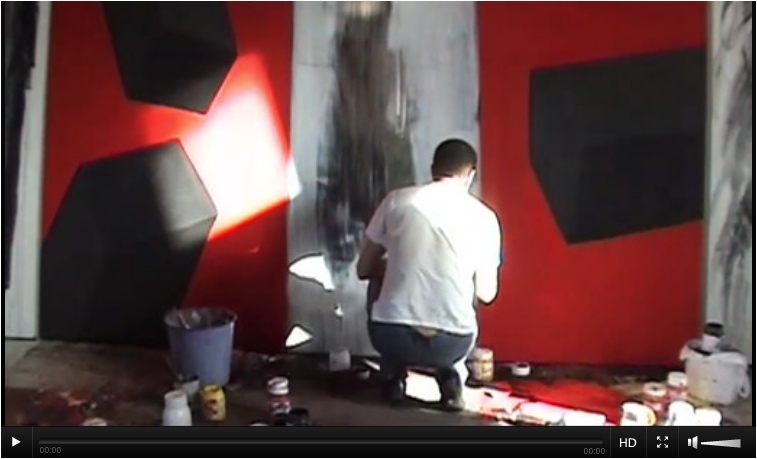 Also see David Lynch Foundation Television to premiere David S. Ware: A World of Sound. The Ware and more profiles by Amine and other DLF.TV filmmakers are available here. This blog post was published November 30, 2009. After working for the David Lynch Foundation, Amine would become a teacher of Transcendental Meditation and later taught TM and filmmaking at Maharishi University. He gave a wonderful interview to Nylon Magazine, and later invited a photographer from the Ottumwa Courier into his classroom as part of her profile on the university. This entry was posted on November 30, 2009 at 1:46 am and is filed under Art, David Lynch Foundation, Videos. You can follow any responses to this entry through the RSS 2.0 feed. You can leave a response, or trackback from your own site.